I'm not gonna criticize the difficulty because to be fair, it's not that hard. I've already finished one level and almost finished other two. It's just that people here are better at keen 1 than me. Just completed the fifth level. Very unexpected, very cool. I was getting worried I'd be stuck in what is quite frankly, and as the story indicates, intentionally, a really ugly world. After seeing the butler robot, which is a really clever animation, can confirm, these are your best sprites. 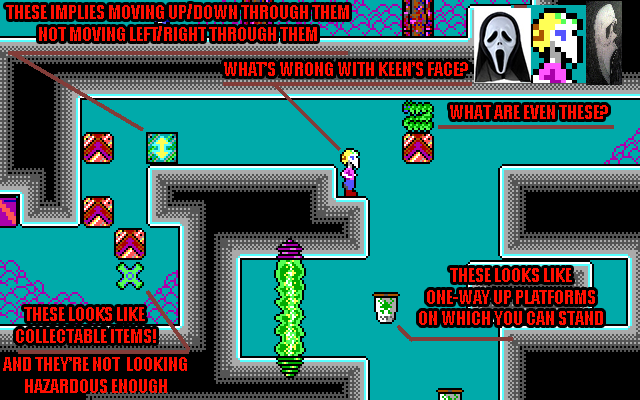 Re difficulty: I wouldn't say these are hard levels. Level 3 and 4 were both really unforgiving in terms of length vs number of challenges, but I know every time I died was because I was either careless or impatient, not because something was particularly hard. Well, after playing all of the levels, I can say that the first 5 levels are actually a walk in the park compared to what comes next. What comes after those 5-6 levels I can only describe as pure keenrush insanity at its best (or worse, depending on how you look at it). There are some really clever puzzles and designs. But I'll not comment on the difficulty. - this is (ultra) cool. - these kind of black levels after the level in the above screenshot are not. Thumbs up for the kung-fu bunny. This is arguably the most impressive keen 1-3 mod enemy ever! Guess I'm going to give this a chance now. Just another case of managing time with certain tasks again. As for the other thread on the mod, sadly I think that I know the feeling of coming near the end, only to lack the motivation to finish the last remaining bits. All the work done so far is what matters, though! Boy oh boy, I have to say, it is very hard. Thanks for the contribution. Shall I put it to the CG Game Store? What I can say from my perspective is, that I'm not a huge fan of the Keen 1-3 series BUT I gave your mod a try since you wrote that it was a pain to finish it. Let's see how patient I will be during the next couple of days or weeks. For now I only can say, that the items confuse me a little bit. If I wouldnt have read this thread here in the forums I would be probably very surprised during the gameplay. ;D But I guess thats only a matter of memory! @proYorp: It's good that you noticed that mirror thing in levels 3 and 4. I made a custom program that flipped the level data (and changed tiles where necessary, like ceilings to floors), so I kept designing one level and beta testing two. (The second halves of those level are completely different, needless to say.) I too like the ambience in the fifth level, the beginning, I'm glad how it turned out. @Roobar: I think those arrow tiles imply well what they mean, that where the arrow is pointing that edge is blocked. 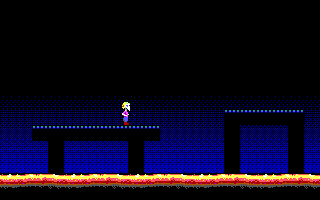 You see both tiles right in the first level and their functionality becomes clear there (or should). I wanted to make Keen sort of alien-like. Not a mask. Can't say there was anything rational behind that decision, simply a random idea. Also, I thought the player would remember the take-away coffees (they're the first collectiable in the game) and not mistake for platforms. Thanks for playing the levels, too bad you feel they were 'pure keenrush insanity' because my goal was the opposite. I still can't decide if people just aren't good enough players or if these levels are too difficult despite everything. @Ceilick: It's good to see that you feel what I intended, that the levels aren't too difficult, that dying happens because the player is not careful enough, no special skills needed. @gerstrong: Feel free to add it to CG. Thanks for playing. @XrackProject: Thanks a lot for the video-playing. It's both interesting and useful for me to see these, plus it gives the mod a lot more visibility when there are videos. While I don't understand much German, I understand some and liked listening to it (and your reactions were amusing). I made a custom program that flipped the level data (and changed tiles where necessary, like ceilings to floors), so I kept designing one level and beta testing two. If you could, please make your custom program open-source! in my opinion this seems to be a very useful tool to have for future mods to come... great idea by the way! The CG video immediately points out a shortcomming of CG itself; it doesn't draw the starting sequence the way Keen Vorticons does, leaving the bottom row of pixels of the rising bitmap on the screen. I think Agony is only the second mod to use that effect though. @Nisaba: I'm not the biggest proponent of open source... Plus it's really bad coding (of which I'm ashamed), uncommented, and not usable at all unless one understands how the program works... By the way, have you had a chance to try this mod yet? I'd like to know what you think -- obviously. @Levellass: Please, 'Lass, can't you tell me what you think of this mod? Why is it so difficult? *sets stunner to 'neural fry', points at own head* I demand answers, now!! Seriously, you know this engine and its properties better than almost anyone - and most probably better than anyone - so I've all this time wished you could say what you think of it; what do you think of all the things I did without any patching and with limited special tiles. Why is everyone so silent? Is everyone laughing behind my back? I start to believe that. But I don't care about that either, I'd just like to know! Sorry about ranting and raving but I just can't understand why everyone I most want to hear from, everyone who really knows about K1-3 modding, keeps silent. If it's overwhelming disappointment, I want to hear that in more details. SIGH!! @XrackProject: Thanks so much for playing further. These videos give me a lot insight on what kind of jumps and moves people find difficult (even if it's just one player, it's probably true for many others). I think I already see advancement in your Keen 1 playing. But I think you need to develop your jumping accuracy. Also there's no danger in walking nearer to edges; you often seem to jump further from the edge than necessary and as a result often almost not make a jump that's otherwise easy. But I guess it all just takes getting used to this engine, which is not the easiest. Thanks for persisting. sorry, hadn't got the chance yet. to time, really... things are really hectic around here. But I'm looking forward to play your mod somewhere around Yuletide. Your welcome! Well, lets just say ... I dont trust the Keen 1 engine. ;D While playing my brain needs 90% to focus on the game and the rest 10% is talking. Ususally I am able to talk more comfortable during Keen games, but in this one I have to invest more energy into everything. Its very challenging at least for me! It is fair enough that you placed in difficult levels more points in order to get the lost lifes. One thing I asked even during my part 3 video: Is it possible to collect more then 6 lifes in this mod? Or is 6 max? @Nisaba: Ah, that explains it... Well, I hope you'll enjoy the mod when you eventually get to try it. It ought to be much easier than anything I've done before (as mentioned a few times, heh). from what I've seen so far, this is one your best, if not the best sprite animation work. you know, that I'm really impressed by all of your mods. I love the colour-richness and your attention to detail. and your heavy patched mod bring so much freshness to the community. As for the lives, there is no reason you shouldn't be able to collect more than 6 (even if the game doesn't display them visually, they are in the memory!) -- assuming you don't die too many times.